This Tuesday Andy and Jason were delighted to welcome back Tom Crawford and Guy Taylor to give some new updates on their own cases and also the plans they have for the near future. Tom started the ball rolling by updating us on his own case and then went on to tell us about the upcoming meetings that are planned in the near future across England. We then heard in detail about Guy’s recent victories in court using no case to answer including a 70 year old disabled woman who was bullied with charges in order to get her son to carry the can. Guy also told us how his own case where he was kidnapped from his home on a Sunday night by police officers with no paperwork who threatened to kick the door in. 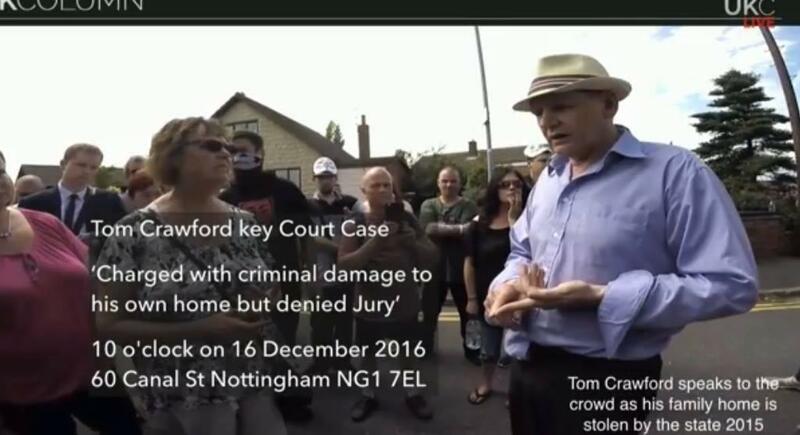 If you want to keep up with Tom’s latest developments you can check out his facebook page and also on his facebook groups Eviction Fraud of The Banks and Evictees and Families Unite. To keep up with Guy you can follow him on twitter @magncartman and also Guy Taylor Issues on facebook. Many thanks to Tom Crawford and Guy Taylor for the updates and great information and also to all our loyal listeners for their continued supportAlso please try and attend the upcoming meeting in Nottingham on 31st July if you possibly can. This show was first broadcast on 12/07/2016. 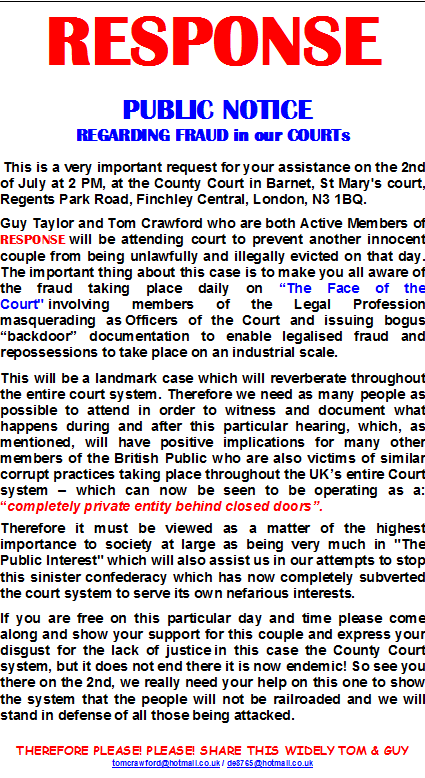 David Cameron - Terrorism of the Public, and Fraud Upon The Court must end NOW! NO ONE IS SAFE IN THEIR HOME TODAY. Tom Crawford Launches Evictees and families unite. 22 May 2016 — NO ONE is safe in their home in Great Britain. Tom Crawford wakes up the City of London with the launch of a very powerful action group, to protect YOU in your home, and RESTORE victims of false actions by corrupt judges, bankers and police constables. Please support and share. We are responsible to be not PASSIVE. Thanks for signing. Now help this campaign succeed by getting your friends to sign! 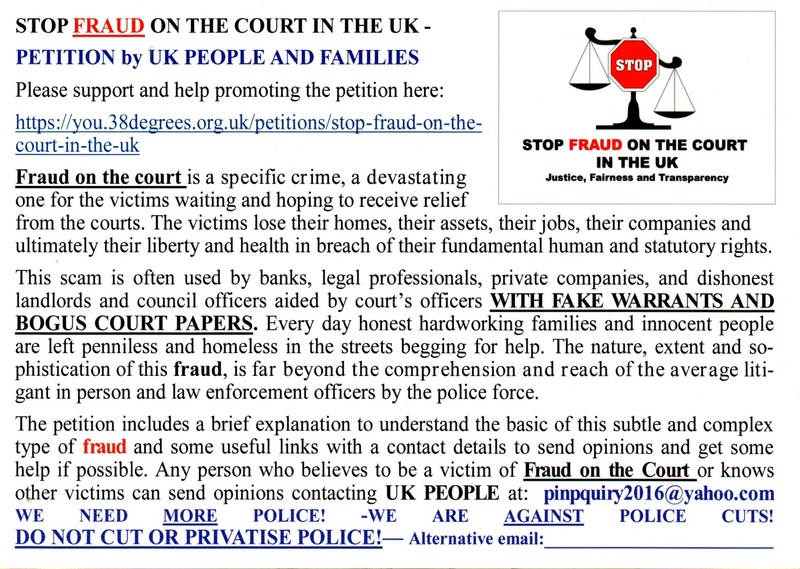 Ask the Secretary of State for Justice Rt Hon Michael Gove MP and Home Secretary Rt Hon Theresa May MP to investigate and put a stop to the serious organised crime of Fraud on the Court with a public scrutiny via a Public Inquiry. Those instigating Fraud on the Court do not pay the court’s fees to obtain fake warrants or court’s orders used to deprive law abiding citizens stealing properties, land, money and assets. Invalid court’s papers are then used to secure unlawful entry and adverse occupation of residential premises by means of violence combined with the creation of a sense of authenticity through the invention of false court’s documents which appear to be factual.Fraud on the Court involves (with intent) a serious abuse of the court’s process and “contempt of court” (Common Law). The victims are routinely ignored by the already overstretched police and other law enforcement bodies who are unable to investigate thoroughly and independently. The only option left is to go back in the hands of the same staff in courts who are perpetrating the scam. The victims are denied inspection and copies of data from the court’s file which remain concealed.Victims are also crucially denied access to and release of the computerised court records where all the documents and interactions with the court of any party into the proceedings are recorded.The nature, extent and sophistication of this fraud, is far beyond the comprehension and reach of the average litigant in person and law enforcement officers by the police force. The non-payment of the court’s fee is not only a major deception and fraud on the on the public purse but also on the individual. This theft on the public happens in a time when the UK court’s system is crying for more funds. The recent sharp increase in the court’s fees have already reduced considerably the access to justice for the most vulnerable that cannot afford to pay.Fraud upon the court is devastating for the victims waiting and hoping to receive relief from the courts. The victims lose their homes, their assets, their jobs, their companies and ultimately their liberty and health in breach of their fundamental statutory rights. This adds burden on the already struggling NHS and Social Security systems whilst the income from many tax payers is lost. This scam is often used by banks, legal professionals, private companies, and dishonest landlords and council officers aided by court’s officers. Meanwhile criminal convictions and assets stripping founded on complex illegalities and irregularities send every day honest hardworking families and people left penniless and homeless in the streets begging for help.Innocent families and people are held hostage with children and frail old people ending up homeless and traumatised as victims of Fraud on the Court. Those few victims of Fraud on the Court who persist in chasing justice are being passed between agencies without any result or redress. Stealing from people is a crime. Taking away their assets and homes making people homeless with Fraud on the Court is a very serious and sophisticated crime for which there is no defence for the victims. Fraud of any kind is a crime and Fraud on the Court is one of the worst. An unpunished crime encourages new ones. Those committing Fraud on the Court are still there and get away with impunity. 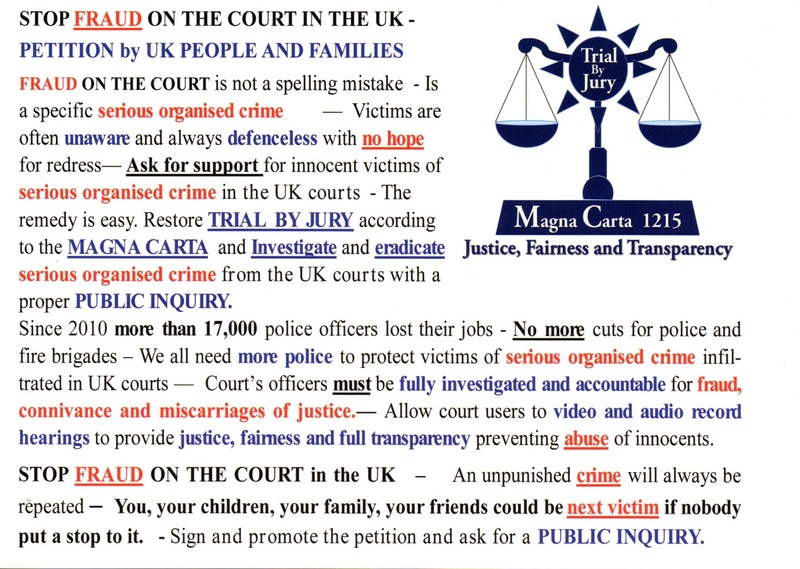 It is only a matter of time before someone you know will become the next victim.In the public interest, in order to strengthen the fairness, accountability and transparency and in name of justice join by signing this petition for a Public Inquiry and ask for the Parliament’s full support to investigate and stop the Fraud on the Court in the UK.